Place the cauliflower florets in single layer in a larger ovenproof dish. Toss in the onions. Add garlic, lemon juice and pepper to the oil, stir and drizzle evenly cauliflower florets and onion slices. Season with salt. Bake in the oven at 220˚C for about 30 minutes or until done (fork tines should easily pierce the cauliflower) and golden-brown on the top. Serve as a side dish with meat or with rice, cooked barley or couscous. 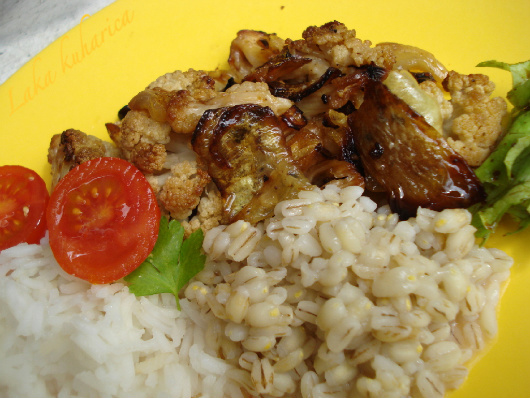 Simple and tasty roasted cauliflower side-dish. Excellent with meat, rice, cooked barley or couscous.